Gepost door My Scrambled Style op 5:32 p.m. Very nice outfit, lovely knitt. Love so much sweater and boots! Great look! I love your jumper! have a nice weekend! Hele euke outfit, vooral de laarsjes! Beautiful outfit!I love your boots! love the sweater and especially its color! great style - great blo! Love the colors, You look awesome in this stylization. I must have those shoes! Great outfit! such a cool sweater ! 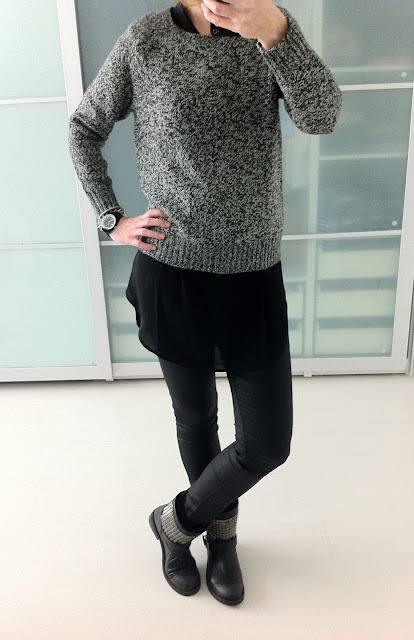 black and grey are such great combos! Het is inderdaad een lekker truitje, maar het valt tegen hoe warm hij is. Nice look!! I love the jumper!! Cute salt and pepper sweatshirt!! I am your newest follower. Love your blog!